NOAA's GOES-East satellite captured this stunning view of the Americas on Earth Day, April 22, 2014 at 11:45 UTC/7:45 a.m. EDT. The data from GOES-East was made into an image by the NASA/NOAA GOES Project at NASA's Goddard Space Flight Center in Greenbelt, Md. A U.S. satellite has captured the ultimate Earth Day view from space, showing the entire planet in a stunning group shot of humanity. 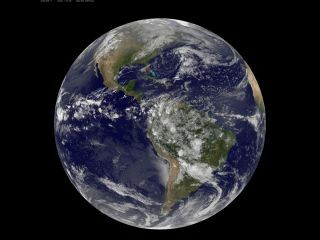 The photo, taken today (April 22) to mark Earth Day, was captured by the GOES-East satellite at 7:45 a.m. EDT (1145 GMT) and released by NASA. It shows North and South America as viewed from 22,300 miles (35,888 kilometers) above the planet. Near the Earth's equator, a line of thunderstorms associated with the so-called Intertropical Convergence Zone (ITCZ), a weather zone that encircles the equator, can be seen as more storm clouds blanket parts of Columbia, Venezuela, Ecuador, Peru, Bolivia, Paraguay and Brazil, according to NASA's description. The GOES satellites make up a constellation of Earth-watching spacecraft that provides constant monitoring of the planet for data analysis. The satellites fly in so-called geostationary orbits that allow them to hover over a specific point of Earth for continuous weather monitoring. The GOES program is overseen by the National Oceanic and Atmospheric Administration and NASA's Goddard Space Flight Center in Greenbelt, Md.